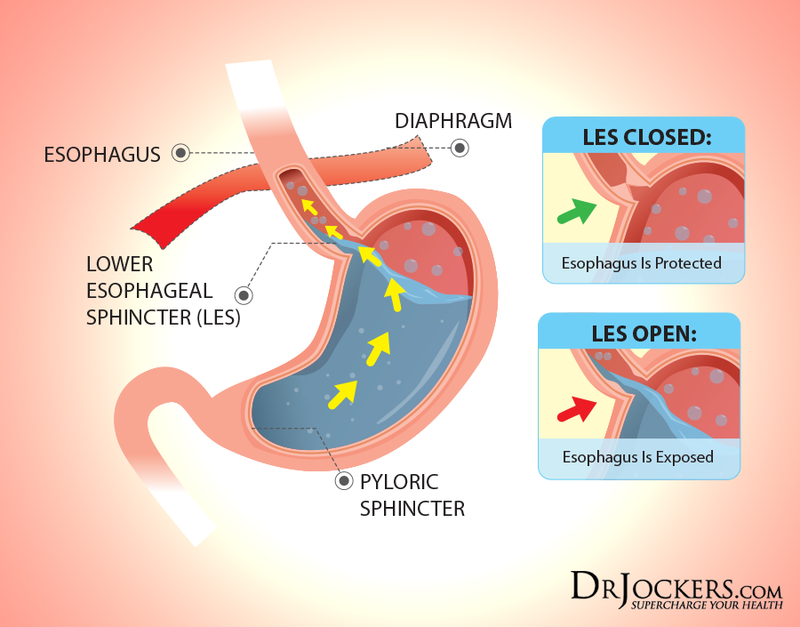 If the LES is not closing well it allows for food, liquid and hydrochloric acid to leak back into the esophagus. The inner esophageal tissue is not designed to handle the strong acidity which inflames the region. This causes the characteristic heartburn sensation. Chronically damaging the esophageal tissue often results in esophageal cancer and other more serious conditions (1, 2). The most common risk factors for GERD include anything that obstructs the esophagus or stomach region such as hiatal hernia, pregnancy, and scleroderma. Other proven risk factors include obesity, smoking, and alcohol usage. Many prescription medications list GERD or acid reflux as a common side effect so this should always be considered (3). The popular belief is that acid reflux is due to an excessive amount of hydrochloric acid in the stomach. New science has revealed that this is not the case. GERD is most often caused by too little hydrochloric acid being secreted by the stomach (4, 5). During digestion the stomach secretes acid to lower its pH to around 1.5-2.5 range. More protein in the meal results in a greater need for stomach acid. Individuals with non-obstructive acid reflux are often not able to get their pH low enough. The LES is known to be a pH sensitive valve that initiates closure when pH drops under 3.0. When the stomach does not have enough acid the LES remains open and acid can spill into the esophageal region and damage the tissue. Additionally, when the diaphragm herniates through the stomach sphincter it is called a hiatal hernia and can lead to the symptoms of acid reflux. A hiatal hernia sounds like a painful condition, considering the stomach pushes through an opening in the diaphragm and into the chest, but most people don’t notice any symptoms. It is frequently discovered when a person has a chest x-ray or abdominal x-rays (including upper GI series and CT scans where the patient swallows barium or another contrast material) (6). It can also be found when a gastrointestinal endoscopy of the esophagus, stomach, and duodenum is performed. You may also be able to feel a hiatal hernia if you put your hand under your left breast bone and feel a little bulge. If so, you can try a self-massage by pushing this bulge down. 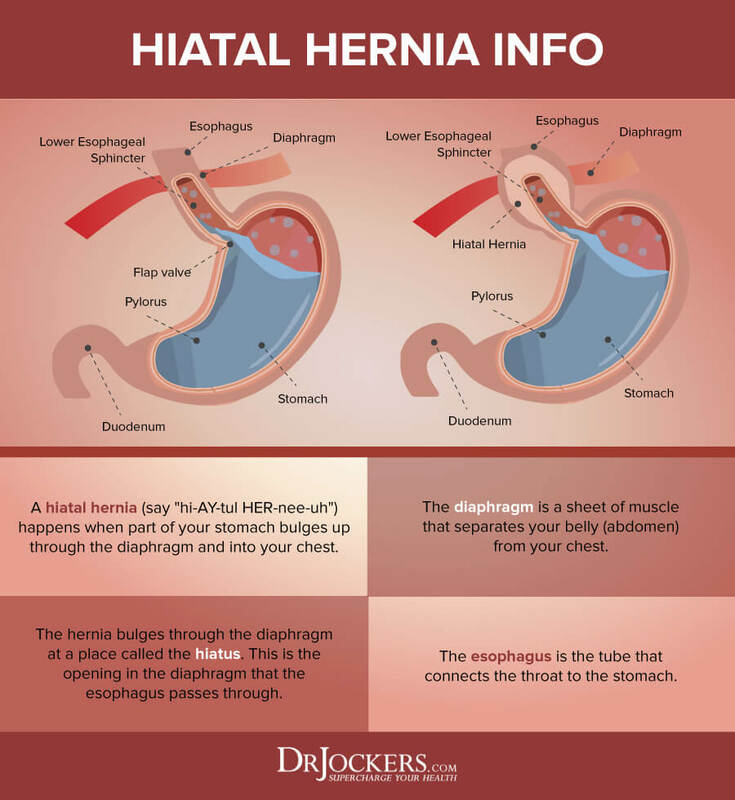 I go over a number of strategies you can apply to reduce a hiatal hernia in this article. Many people use antacids to relieve the pain of heartburn. This covers up the symptom (reducing acidity) but only makes the problem worse by decreasing the acidity. This process limits the body from effectively digesting the food. This causes further stress on the enzymatic system of the pancreas as well as the other digestive organs. Antacids, processed foods and many medications deplete the body of critical b vitamins and trace minerals that are necessary to create a sufficient supply of stomach acid (6, 7). H.Pylori is a very sophisticated microorganism that has incredible adaptive advantages that give it the ability to survive the stomach’s harsh environment. It produces an enzyme called “urease” which breaks down the urea in the stomach into carbon dioxide and ammonia. This causes belching and halitosis (bad breath) for the individual and it neutralizes the acidifying effects of hydrochloric acid (8). Hydrochloric acid (HCL) is necessary for creating an acidic environment in the stomach to digest protein and ionize minerals. This also helps to stimulate bile release from the gallbladder to effectively metabolize fat in the small intestine. When the body is unable to secrete enough HCL, we have poor protein and fat digestion and may develop key nutrient deficiencies. H Pylori disrupts the digestive process so it can lead to inflammation throughout the gut and gastrointestinal permeability. This state of leaky gut can also cause iron-deficient anemia, irritable bowel symptoms with fluctuating diarrhea and constipation and ulcerative colitis. By damaging the gut lining, we also develop an increased risk for anemia, thyroid problems, osteoporosis & auto-immunity (9). Hydrochloric acid is necessary for creating an acidic environment in the stomach to digest protein and ionize minerals. This also helps to stimulate bile release from the gallbladder to effectively metabolize fat in the small intestine. Without these key functions working optimally we become at risk for anemia, thyroid problems, osteoporosis and auto-immunity (10,11,12). 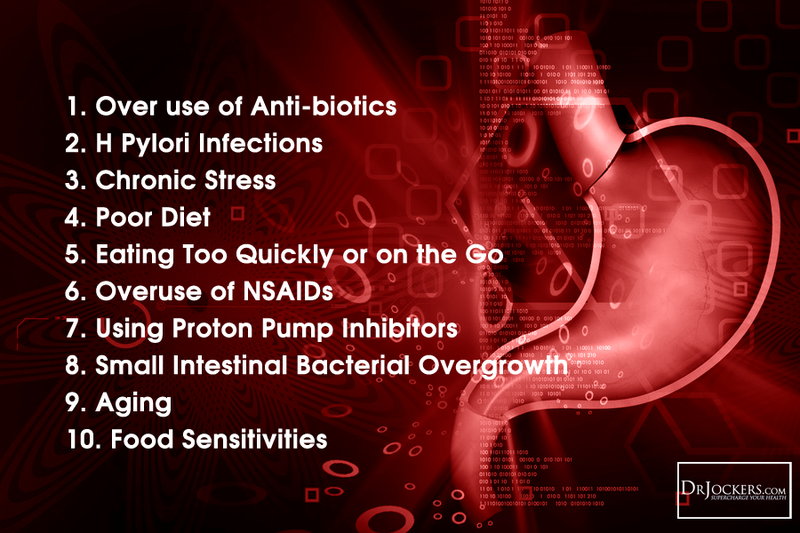 Low stomach acid in a very common problem especially in older individuals or those who have suffered from various infections like H Pylori, been on anti-biotics and other medications like non-steroidal anti-inflammatories (13, 14, 15). Low stomach acid sets the stage for damage to the delicate lining of the digestive tract and the formation of leaky gut syndrome. When you have low stomach acid you are unable to effectively breakdown protein in the stomach. This allows very large proteins to get into the small intestine and creates major stress on the pancreas to produce enough enzymes to metabolize the proteins. Large proteins and incomplete digestion can cause leaky gut syndrome and trigger auto-immune activity in different regions of the body. Improper protein digestion also leads to small intestinal bacterial overgrowth, fuels Candida and other parasites. It also creates an acidic blood stream and depletes minerals throughout the body. Mineral depletion leads to the inability to form stomach acid and the vicious cycle continues. This unique test involves drinking baking soda and creating a chemical reaction within your stomach between the baking soda (sodium bicarbonate) and the hydrochloric acid (HCL). This normally results in carbon dioxide gas production which leads to burping. Ingesting baking soda has been a natural remedy for upset stomachs for centuries. This test costs you about $3 if you need to buy a new box of baking soda, so there is not much to lose. I advise this test because of its safety and low cost and you could easily do it tommorrow. But, there are problems with this test. Overall, there are a lot of variables to control. Trying to minimize all the variables can be tough and I would recommend performing the test 3 consecutive mornings to find an average. By doing this, you’re looking for more of a pattern than a onetime test of “yes” or “no.” Also, to increase accuracy of the test, you must do it as soon as you wake up in the morning before putting anything in your mouth. An anti-inflammatory lifestyle incorporates a diet rich in phytonutrient dense vegetables, healthy fat and clean protein sources. Healthy fat sources include coconut products, avocados, olive oil, & purified omega-3 fish oil supplements. Healthy protein includes wild-caught fish, grass-fed red meat and free range poultry and eggs. Anti-inflammatory herbs such as turmeric, cinnamon, ginger, oregano & garlic are also powerful aids. Non-processed pink salts, sea vegetables, sea algae and cereal grasses should be used regularly to provide an abundance of critical trace minerals. Individuals should avoid eating excessively large meals. Food should be eaten at least 2 hours before bed to allow gravity to push food through the system. Digestive enzymes and probiotics are particularly helpful at enhancing the digestive process. Raw apple cider vinegar with the fermented mother intact is rich in acetic acid, digestive enzymes and good bacteria. 2 tsp of raw apple cider vinegar in water before a high protein meal is particularly helpful at improving stomach acid levels to prepare for digestion. It is also helpful to use apple cider vinegar to marinate meat, as a salad dressing and on grains such as rice. 1. Use an Anti-Inflammatory Nutrition Plan: Most people notice a reduction in acid reflux symptoms when they take out the most common inflammatory foods from their diet. This would include eliminating gluten, pasteurized dairy, soy, peanuts, corn and refined vegetable oils. Instead, consume a healing diet that is low in carbohydrates and high in healthy fats as described in this article. 2. Don’t Eat Late at Night: Finish your last meal at least 2-3 hours before bed. 3. Use Apple Cider Vinegar: Have 1-2 tbsps of ACV in 4oz of water about 10 minutes before each large meal. 4. Only Eat 1 Solid Food Meal Daily: Drink green drinks and smoothies during the day. These are easier on the digestive system. One good quality solid food meal daily along with several protein shakes or smoothies and green drinks will help the digestive system to heal. 5. Use Digestive Enzymes: Taking a digestive enzyme supplement like Super DZyme here can help the body to digest food more effectively and reduce stress on the entire digestive system. 6. Consume Fermented Foods Everyday: Have a few tablespoons of organic kimchi, saeurkraut, pickles, coconut milk yogurt or kefir or fermented raw, grass-fed dairy each day. The unique probiotics and enzymes within these foods help to improve your microbiome and enhance HCL production. 7. Consume Fermented Drinks & Tonics: This includes apple cider vinegar, coconut water kefir, fermented grass-fed whey and kombucha. Drink 2-4oz daily before a meal or meals to improve digestion and HCL production. 8. Use Lemon and Ginger: Make green drinks with a whole lemon or lime and ginger. Both of these have key nutrients that enhance HCL production. 9. Reduce Stress on the Digestive System: Be sure not to try to eat solid foods when you are under stress. 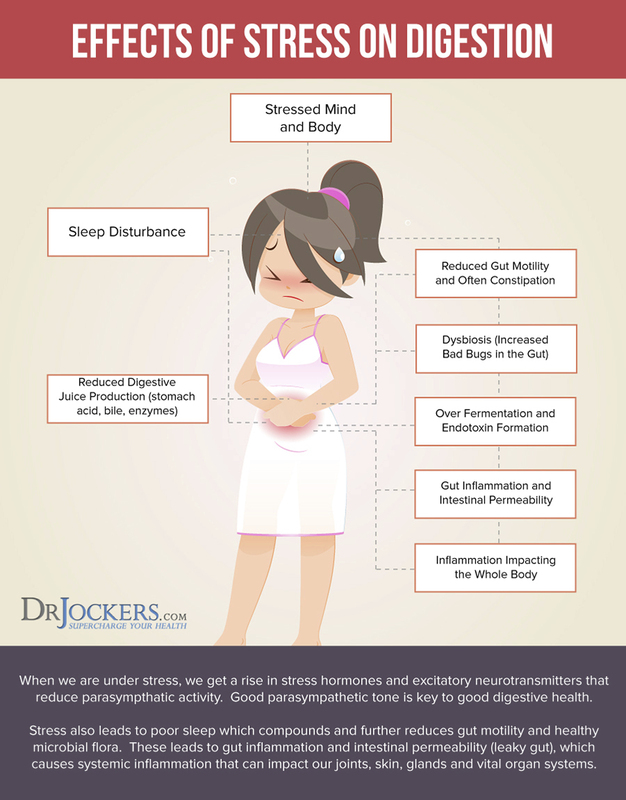 Stress reduces the secretion of digestive juices and enzyme production. I teach people to only consume raw and liquid foods in small quantities during the stressful periods of the day. Enjoy your larger meal with healthy proteins. good fats and veggies at a more relaxed time of day (for many this is in the evening). 9. Sutton I, Neuberger J. Primary biliary cirrhosis: seeking the silent partner of autoimmunity. Gut. 2002;50(6):743-746. Dr Jockers, Can you please email me the form containing foods that are alkaline or acidic to maintain a healthy body PH. Once your pancreactic enymes are low can they be restored? So happy to hear that! 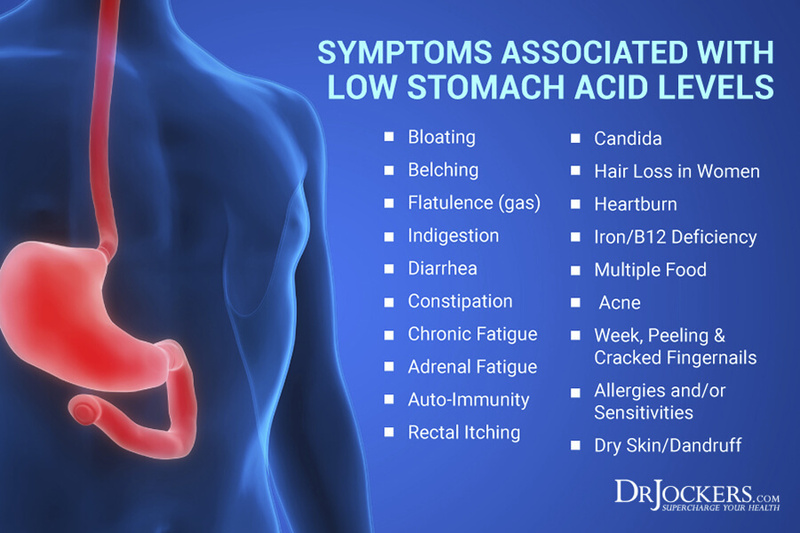 Same for low stomach acid….will it always be like this or can it be fixed? Regarding the baking soda test. I tried it this morning first thing. I didn’t burp in those 5 minutes, but I did have flatulence. Does that count? Gotcha, thanks. I’ll try another couple mornings and see how it goes. With regards to stomach acid, how does alkaline water affect stomach acid levels? Before I started your Digestive Health Program, I was regularly drinking 9.5 pH water every day. I switched to 7.0 during the program, mainly because I’m still unsure how the water pH affects stomach acidity and digestion. Please advice me doctor of special remedies or a diet to stop the hot feeling I feel on my chest and in my throat? Sorry to hear this! Begin by following the recommendations in this article! Try mint leaves, they are really helpful. Mint is EXCELLENT for nausea, but the WORST for Acid Reflux & GERD!! Do not take peppermint or drink peppermint tea if you have gastro esophageal reflux disease (GERD — a condition where stomach acids back up into the esophagus), or hiatal hernia. Peppermint can relax the sphincter between the stomach and esophagus, allowing stomach acids to flow back into the esophagus. Hi. I have been on Nexium since it came out 10-12 years ago. Should i reduce or stop before trying your recomendation. I am also concerned if i have permanantly injured by body by being on it for so long. I get a burning feeling in my throat a lot of the time. Is it wise to use apple cider vinegar for this problem because I have heard people say that it is the pepsin in the throat which is causing the burning feeling in my throat therefore ACV will only make things worse. I also heard that the pepsin in the throat can eat away at the tissue when exposed to more acid.Could you recommend natural remedies to deal with this burning sensation I am experiencing? Hey Adam, aloe vera is very safe. Hi Doctor I have been having a lot of bloated stomach recently and wanted to ask for some advice on remedies or diet to deal with this. I also want to tell you that for the past 2 weeks I have been fasting from dawn to sunset as part of the month of Ramadan. Hi Doctor I have noticed when I have certain foods like gluten or dairy I tend to get a little bit bloated. Could you give some advice on how to deal with the bloating problem. Sounds like you may need to avoid those foods James! Using digestive enzymes may help cut down on bloating but you likely will still have some kind of inflammatory reaction to those foods as most people do. I heard some people say you shouldn’t drink water 30 minutes before a meal and should wait 30 minutes after a meal to drink water. Does this mean I shouldn’t drink apple cider vinegar 30 minutes before a meal to improve my digestion? Yes you should drink as little as possible. You can do a shot of ACV in 2-4 oz of water right before a meal though. I have a lot of burning in my throat and have a bloated stomach a lot of the time. I was thinking of trying aloe Vera juice for my burning throat but after reading some articles online that said you shouldn’t consume it if you have irritable bowel syndrome I am now unsure whether I should consume it at all. Hey James, this sounds like low stomach acid. Aloe may help soothe any irritation but ultimately supporting stomach acids production will be the most important. I wanted to ask you doctor about your opinions on low acid diet for reflux whether you agree with it. I would also like to ask you whether you agree with other physicians who say that reflux could be the result of pepsin which attached to your throat which is activated each time you consume acidic food. Hi Dr Jockers I wanted to ask you if low acid production in my stomach is the cause for my burning throat why do I get this same feeling when I eat chocolate or consume orange juice? In most cases I find that a burning throat is caused by low stomach acid James. This is because stomach acid stimulates the esophageal sphincter to close. Certain foods may cause relaxation of this closing between the throat and stomach as well. Hi Doctor can you please give me a list of natural remedies to deal with a burning feeling in my mouth and throat. I tried ACV this morning but I am still feeling a burning feeling in my mouth and throat. Is it safe me to consume aloe vera juice if I have a bloated stomach which i do a lot of the time? I say this because i read an article warning that it can cause diarrhea. That should be no problem Adam! If you notice negative effects then stop taking it. 2 questions. First I have taken prilosec for the just 2 days and I would like to stop taking it and switch over to taking HCL. I do not know if they would have any interactions but do I need to wait for a certain amount of time before taking HCL capsules? Second question I was trying to cure my acid reflux naturally by drinking apple cider vinegar 10 minutes before meals and taking digestive enzyme supplements. I would take a digestive enzyme before I had a meal with meat in it. 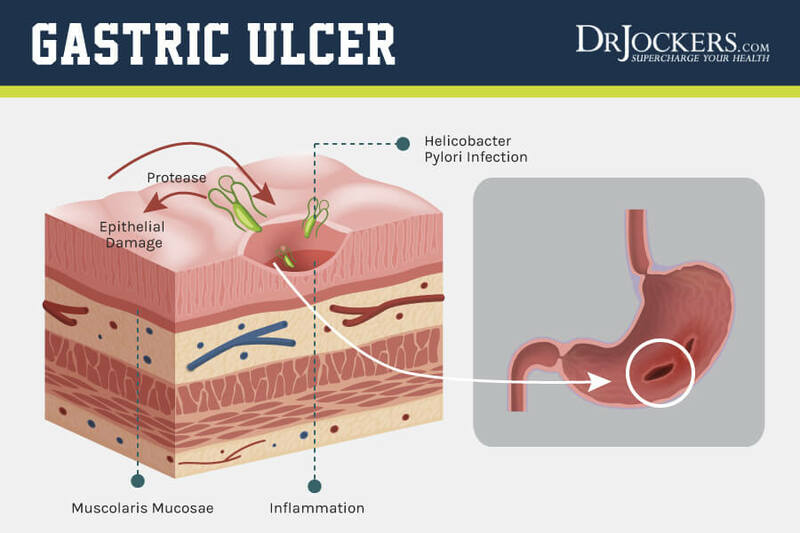 While doing this though I was still having acid reflux throughout the day and my throat would feel like it was clenching up and it started to hurt very badly until I gave in and took prilosec after 6 days. Would taking HCL capsules instead of Digestive enzymes the way I did fix my throat problem? It could help Matthew! You should be able to start it no problem. Work your way up one cap at a time until you find a dose that gives you heartburn and take one less than that in the middle of your meals! Hi Doctor I want to ask you if it is safe for me to use slippery elm bark powder for gerd? It may be helpful Adam! It should be safe to try it out and see what happens for 1-2 weeks. Hi doctor I suffer from digestive issues such as bloating. Typically I get bloated when I drink milk or eat bread. I was thinking of getting a food intolerance test to see what foods i am intolerant to. Is this a good idea doctor? I have recently been diagnosed with acid reflux, gastritis and esophagitis, but the Dr was able to revert that during an endoscopy. I’m taking sulcrafalte and radinitidine. I don’t smoke or drink. I don’t eat meat or dairy. I’m active, played sport most part of my life, I’m only 30 years old… I have been pretty healthy all my life. My main problem is my breath. I haven’t been wanting to be around people because as soon as I open my mouth they cover their noses. I have been dealing with bad breath for a while now. I have gone to different doctors and even dentists, but they don’t seem to care or try to acknowledge my concern. The last Dr said that was that there was nothing wrong with my breath, I was just too sensitive. But, clearly there is something wrong. Can you please help? I don’t know what else to do. You might consider working with a functional nutrition practitioner and getting some labs done to see what is going on “under the hood”. Email michael@drjockers.com for recommendations! Maybe you should floss? I find this helps with bad breath. Also, if you eat garlic it will make you have bad breath guaranteed. It could be some of your medication or maybe a filling needs to be redone. I suffered from this confusing and embarrassing condition for 2 years. But it is FINALLY going away. I still have some problems but it is mostly a bit of throat clearing at times. Before it was constant like every minute of the day, like how you get at the end of a cold. I thought how can I live like this? This is not normal and what was happening to me?! and the doctors were no help saying I have a combination of postnasal drip and acid reflux. I had no heartburn. Often I can’t talk because my voice box was covered with phlegm. It started with a cold sinus virus. It must have done some kind of damage to my throat and eventually my stomach which started making huge growling and squealing sounds. But I started taking Zantac, took aloe vera morning and night, calcium supplement with vitamin D, fish oil even krill, lots of yoghourt and honey and mega doses of fruit juices like cranberry. I would put like 5 big spoons of honey inside my yoghurt. Sometimes the Licorice DGL at night and a digestive enzyme and magnesium supplement. I make sure to eat something fermented every day like pickles or sauerkraut and even mustard in my sandwiches. I did notice that some foods made it worse like rice, tomatoes. Now I am much better than I was. Maybe it was the Zantac? Maybe I had an ulcer? Something had to have caused these symptoms and I will never know. Hi Doctor I want to ask you is it dangerous to use hcl supplement without the guidance of a doctor. I would like to experiment with HCL for my gerd but I was a bit put off when I read some articles which stated that it is dangerous to use without the supervision of a doctor. HCL is very safe when you use the HCL challenge as I’ve mentioned above Jennifer! Hi Dr Jockers I have been diagnosed with Barrets esophagus and I have been told to take omeprazole to control this condition. Are there any natural alternatives to the PPI medication. So sorry to hear that! I would recommend following the steps in this article. If I eat acid producing and heat producing foods(many healthy-meats,coffee teas,alcohol,oils,sugars,many spices,grains oats,starches,fruits and acids)I get burning skin ,stomach ,and acid reflux.Things that helps is salads ,,fruits sometimes,lean proteins….More expensive if you got the $,and food prep to eat this way,but its better than being sick. Yes for sure, but well worth it! Do you have any articles about Bile reflux/ bile gastritis? I have been dealing with this for 5+ years and it’s been much worse lately. Constant burning pain in my upper abdomen, nausea, and bloating all make it very painful and difficult to eat. A severe episode can cause me to lose too much weight. Thank you. I have silent reflux which has been worse lately due to unavoidable stress. I tried taking HCl yesterday, one 650mg capsule before each meal. I has burning in my throat for the first time in my life. Should I continue with the HCl and increase it or stop taking it? Thank you for taking the time to respond! Sorry to hear this! It is best to take the HCL before the meal – always during or right after. I would recommend starting by just taking 1 tbsp of apple cider vinegar in 2-4 oz of water and drinking that before the meal and see if that helps. Yes that can be an issue. Be sure to follow the instructions in the article. Be Blessed! Sorry to hear that Gloria! Be sure to read through and apply what I teach in this article. I used Metagenics AR/BR for SIBO. But it burned my throat and heart. I stopped taking it after 4 days. I can not use apple sider vinegar because of my throat burning. What should I do? Should I try to take apple cider vinegar and honey with water? I live in Cyprus, I can not get treatment here. I forgot to write I have acid reflux. Sorry to hear this! I would be sure to follow the other suggestions in this article! Yes, ACV and honey diluted in water can be helpful! I am using Iberogast for gas problem. Do you know if it helps to increase stomach acid? I can not find any information . Can you help me about it? Yes this can be helpful for improving stomach acid levels! I hear sizzling in my throat. I drink apple cider vinegar to increase stomach acid. Can you suggest any other home remedy to increase stomach acid in a short time? Under Symptoms Associated with Low Stomach Acid Levels shouldn’t there be something after Multiple Food. Could it be allergies? I was born with allergies to milk, soy and eggs. Sixty years later I am also allergic to wheat, and those were the only ones tested. I can understand allergies or intolerances later in life due to gut issues but have never known why as a 9 month old, I could not tolerate cow’s milk, soy milk or eggs. Have been diagnosed with bile reflux and sliding hiatal hernia,have been waking feeling choked and gasping for air,does gerd cause this?